In Post 860 we solved a steady state BVP modeling heat conduction. Today we examine the transient behavior of a rod at constant T put between two heat reservoirs at different temperatures, again T1 = 100, and T2 = 200. The rod will start at 150. Over time, we should expect a solution that approaches the steady state solution: a linear temperature profile from one side of the rod to the other. at , in this example we have as an initial condition. 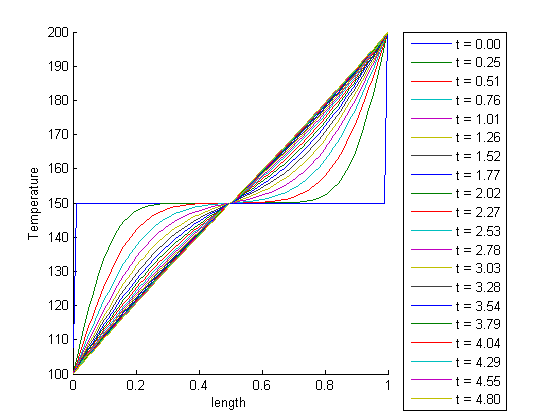 with boundary conditions and . where m is an integer that specifies the problem symmetry. The three function handles define the equations, initial conditions and boundary conditions. x and t are the grids to solve the PDE on. 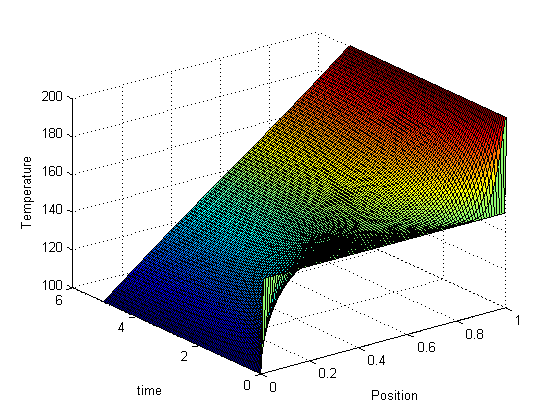 in the surface plot above you can see the approach from the initial conditions to the steady state solution. we can also plot the solutions in 2D, at different times. Our time vector has about 100 elements, so in this loop we plot every 5th time. We set a DisplayName in each plot so we can use them in the legend later. % we use -DynamicLegend to pick up the display names we set above. % this is not an easy way to see the solution. we can create an animated gif to show how the solution evolves over time. It is slightly more clear that the temperature profile evolves from a flat curve, to a linear temperature ramp between the two end points. % We have to define the boundary conditions on the left, and right.